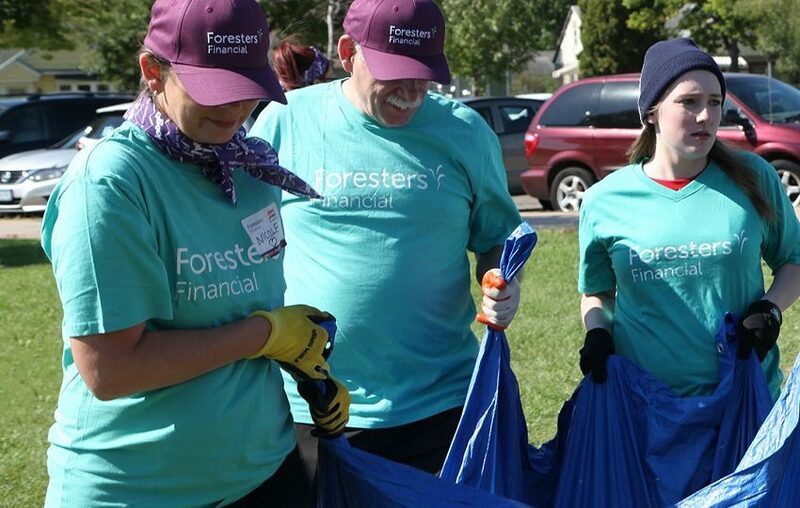 Foresters Financial™ has been building playgrounds with the non-profit KaBOOM! for over 12 years, bringing safe play spaces to 86 cities, 31 U.S. States and Canadian Provinces and most importantly, more than five million children. As we neared our 150th build milestone, we knew we needed to celebrate it someplace with a deeper meaning. Jenny Lind Elementary in Minneapolis was chosen, due to its special relationship with Foresters. Five years ago, the Foresters Minneapolis office was looking for a new way to give back to the community and became aware of Jenny Lind Elementary from an employee whose family member taught at the school. The school is in a low-income neighborhood where all students are eligible for free and reduced meals, and where about 30 percent of students are classified as homeless and highly mobile. The first donations were of bicycles, helmets and board games, and in subsequent years the Minneapolis office donated school supplies (like backpacks, notebooks, paper, pencils, etc. ), sporting equipment as well as financial contributions. Meanwhile, the Jenny Lind community was rocked by a series of tragedies in June 2018. Early in the month, an SUV fleeing state troopers flew through the park adjacent to the school and hit three young children, injuring two critically. Later, the father of one student was killed in an officer-involved shooting, while another student’s father was killed in a car crash. With this as a backdrop, Foresters and KaBOOM! awarded Jenny Lind with a new playground, as well as making it the site for the 150th build celebration. Jenny Lind had an outdated and potentially unsafe playground that needed to be replaced, but the school board didn’t have the money. It was also felt this new play space would help heal some wounds, and give the community a place to connect. In late June a Design Day was held at the school. A group of Jenny Lind students gathered together, pencils and crayons in hand, to design their dream playground. Elements of these sketches were included in the final design. After a summer of waiting, on Saturday, September 22, more than 200 volunteers from the Jenny Lind community and Foresters Financial members, agents and employees converged on the school and started the task of building a playground in under 7 hours. They moved a mountain of mulch to cover over 2,600 square feet of play area. They used over 100 bags of cement to secure apparatuses, a Superdome, slither slide and triple shootout. A Cubic metre of wood was cut and assembled to make picnic tables, benches and a sunshade. Gallons of paint were used to design a sidewalk mural leading into the school. After hours of hard work, the playground was completed. Dozens of Jenny Lind students took part in the closing ceremony, cutting a giant paper ribbon. Now more than 1,300 kids in the local community have a new play space to have fun and grow. Greg is a recovering news junkie and former financial journalist who covered the markets for over a decade. He loves digital storytelling utilizing blogs, video, and social media. He strives to increase financial literacy for all.